How quickly times change. When the 2017 schedule came out, who gave the Jaguars a second thought? I certainly didn’t. Yet it was the Jaguars, and not the Patriots, who stopped the Steelers quest to bring home Lombardi Number 7 in 2017. Yet a lot has happened in the 309 days that have passed since the Steelers playoff loss to the Jaguars. Leonard Fournette smokes Steelers defense in ’17 playoff upset. Perhaps its is appropriate that so many members of the Steelers defense changed numbers during the off season, because a lot has changed. During the September, not only did it look like these had been insufficient, but that perhaps the Steelers had further regressed. But the Steelers travel to Jacksonville riding a 5 game winning streak, that has seen the Steelers improve week in and week out. Across the board, whether you’re looking at third down conversions, Red Zone efficiency, or Ben Roethlisberger’s performance, all of the trends Pittsburgh is taking into this big game are pointed the right way. As Tony Defeo pointed out in taking a shot at the Team Turmoil thesis, it was just two years ago, on November 13, 2016 when the Steelers home loss to the Dallas Cowboys seemed to signal all hope had been lost. Except it wasn’t, and the Steelers have gone 26-6 since then. But story symmetry can be a tricky thing. While Jacksonville had bested the Steelers at Heinz Field in the regular season – with Ryan Shazier on the field – Ben Roethlisberger had played one of the worst, if not the worst game of his career. Big Ben bounced back to play the best football of his life in the second half of 2017. 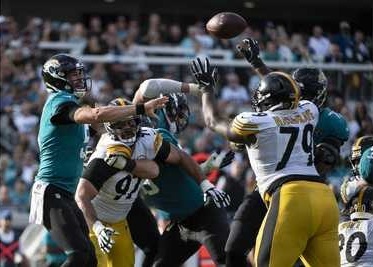 Few thought Jacksonville would give the Steelers must of a test last January, but reports that Stephon Tuitt missed practice time due to an arm injury foreshadowed a flatfooted defensive response to Leonard Fournette’s fierce rushing. And, as fate would have it, Stephon Tuitt will miss the rematch against the Jaguars. So be it. The Jacksonville Jaguars may be on a 5 game losing streak, but this still is the same team that schooled the Patriots early in the year. But they were without Leonard Fournette for most of that stretch. But he will play this afternoon. And that’s good in at least one sense. 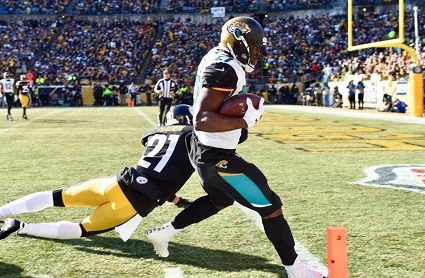 Fournette’s presence means the outcome of today’s Steelers-Jaguars matchup in Jacksonville will still give Steelers Nation a true measure of how far Pittsburgh has come since that playoff defeat or, how far they still need go. A lot changes in one week in the NFL. Seven days ago the question facing the Steelers was whether Ben Roethlisberger could shake off the rust. Today the Steelers defense looks like a sieve, and Pittsburgh is momentarily last in the AFC North. And to make things worse, this was a week of 10-12 hour work days, which means no blogging so instead here are 4 Random Thoughts on the Steelers 2018 season thus far. When the outcome of Sunday’s home opener against the Chiefs became apparent, fans rushed to compare it to the January disaster against the Jaguars. That’s not an accurate description. The Steelers defense wasn’t as bad against the Chiefs as it had been against the Jaguars. It was worse. Jacksonville’s defense scored a touchdown. The Steelers offense also gift-wrapped another. Kansas City got no such stocking suffers from the Steelers offense, although Danny Smith’s special teams did set up the Chiefs first touchdown. Sean Spence was playing whereas a month before he’d been out of football. 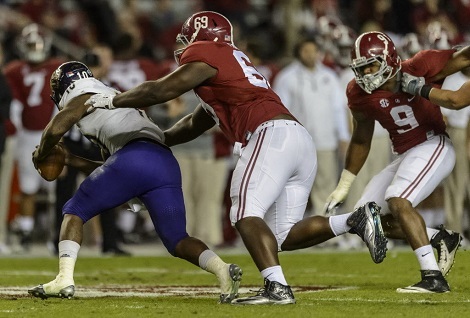 Javon Hargrave was hurt, and played very little, yielding to L.T. Walton. Injuries forced Stephon Tuitt to play with essentially one arm. Mike Mitchell was manning the deep safety slot. Since that awful January performance, the Steelers have signed Jon Bostic, cleaned house in the secondary, bringing in Morgan Burnett and Terrell Edmunds. John Mitchell has gone upstairs replaced by Karl Dunbar, while Carnell Lake has left (and no, I don’t entirely buy reports that Lake left on his own) and Tom Bradley has taken his place. T.J. Watt and Bud Dupree have switched sides. Players like Mike Hilton, Cam Sutton and Artie Burns have had another year to develop and mature. Oh, and Pittsburgh has had a full off season to work on the “communication problems” that plagued Keith Butler‘s defense. 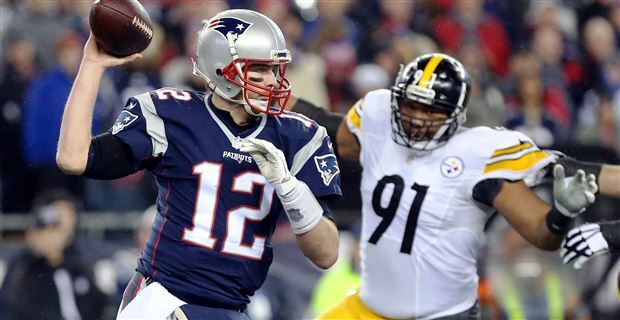 As Cam Heyward reminded, there IS a lot of football left to be played. But thus far the Steelers defense appears to be getting worse, not better. The bright side? They have no where to go but up. 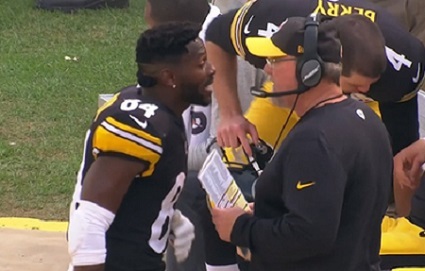 When asked about Antonio Brown‘s Facebook live incident, Steelers President Art Rooney II described it as “minor annoyances.” Against the Chiefs, Browns walked off of the field, and got into shouting matches with Randy Fichtner and wide receivers coach Darryl Drake. Later this week Antonio Brown explained his outburst as a non-outburst, and offered that his non-outburst was fueled by the fact that the Steelers were losing by 40. Except they weren’t, because James Conner was barreling into the end zone with an impressive second effort to tie the game. All wide receivers want the ball. Hines Ward, Lynn Swann and John Stallworth were no different. Yet none of them became Divas. While Antonio Brown has flashed signs of Diva like behavior in the past, it wouldn’t have been fair to have labeled him as such before. Is it fair to label Antonio Brown a Diva now? That’s a popular narrative. And to some degree, whenever you’re losing, everything your critiques they say is true. But there’s really not a lot of evidence to support the “locker room is out of control” missive. Yes, Antonio Brown is a distraction (see above). Yes, Le’Veon Bell‘s absence is an on-going story. But is there anyone else in the locker room that is a problem child? So far, no. And sure, the Steelers do seem to have serious issues on defense. But let’s keep those in context. In 1990, Joe Walton arrived, and installed an offense that his players hated and struggled to grasp. The 1990 Steelers went one month without scoring an offensive touchdown. Assistant coaches could be heard screaming at each other through the headsets. Even Joe Greene remarked, “I hope this isn’t our identity” when quizzed about Walton’s finesse offense. There may be some legit issues in terms of the Tomlin-Butler relationship on managing the defense, but 2 weeks into the season, the Steelers locker room has hardly gone rouge. Kevin Colbert and Mike Tomlin gambled 14.5 million dollars in salary cap space that Le’Veon Bell would be back. That’s 14.5 million that could have gone to the defense. At the time it looked like a wise gamble. As of now, the Steelers are getting nothing form that 14.5 million, and next spring all the extra cap space won’t knock any years off of Ben Roethlisberger’s age. On defense the Steelers gambled that they could bring in Jon Bostic as a stop gap measure and stuck to their guns in the 2018 NFL Draft when they couldn’t get one of the inside linebackers they wanted. The thought was that the Steelers could compensate by deploying extra defensive backs. Thus far that doesn’t look to be the case. But week 3 is only beginning, and there’s still a lot of football left to play. As is more or less the norm, the third wave of free agency has been the busiest in Pittsburgh. 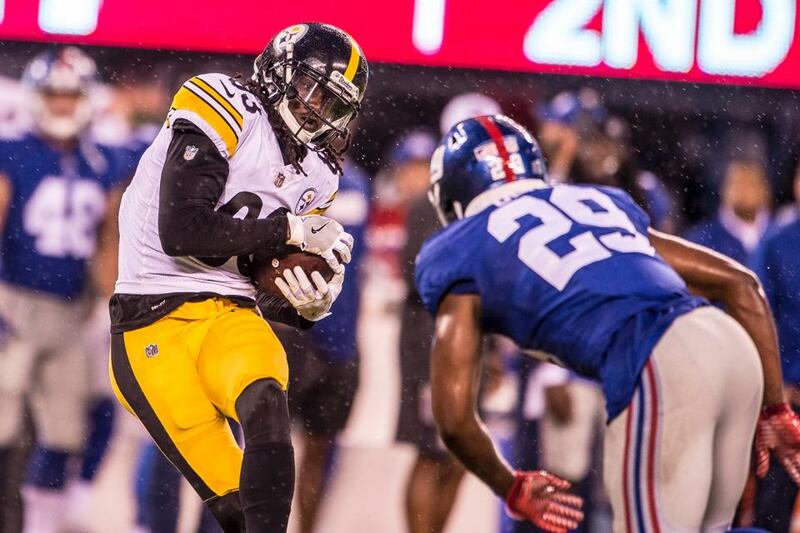 The Steelers signed Nat Berhe, a safety and special teams player from the New York Giants, while the Giants in turn signed William Gay whom the Steelers had cut prior to free agency. And Robert Golden, who Nat Berhe is essentially replacing, has signed with the Kansas City Chiefs. The New York Giants drafted Nat Berhe in the 5th round of the 2014 NFL Draft, taking him at 152 or five slots before the Steelers took Shaquille Richardson. While Berhe is bring brought to Pittsburgh to play special teams, he has experience at safety, and technically provides some depth behind Sean Davis, Morgan Burnett and J.J. Wilcox. Free Agency Predictions Falling a Little Short…. When writing Daniel McCullers free agency profile, I left room leave room for Karl Dunbar to make a push to bring Daniel McCullers back. Word is that Dunbar, the Steelers new defensive line coach did in fact do just that. While that might seem to be cause to claim some ‘Bragging Rights,’ I considered that possibility to be so remote that a “Steelers Resign Daniel McCullers” article was a candidate for this year’s April Fools joke. And Staff writer Tony Defeo also argued that the Steelers should not and would not bring Stevan Ridley back, and of course just yesterday the Steelers resigned Stevan Ridley. Just goes to show you why yours truly is here blogging in Buenos Aires, while the Kevin Colbert’s and Ozzie Newsomes of the world are cashing checks with NFL logos on them. Sometimes you really must take care with what you wish for. Three years ago yours truly had the idea to do a “Steelers Resign Clifton Geathers” article as an April Fools joke. Instead we went with the faux Steelers trade Lawrence Timmons to Miami one that did so well that a credentialed press member actually called the Steelers to verify the nonexistent trade. Which turned out to be a wise choice, because the Steelers actually DID resign Clifton Geathers on April 1st. The day’s news saw the Pittsburgh Steelers resign Daniel McCullers to a one year contract. One can only assume that it is for a veteran minimum which would guarantee McCullers nothing, but at this point in his career one has to wonder why the Steelers would even devote one of their 90 off season roster spots Daniel McCullers. As our free agent focus profile of Daniel McCullers pointed out, “Big D = Disappointment.” At 6’7″ and 350 plus pounds, Daniel McCullers is every defensive coordinator’s fantasy. 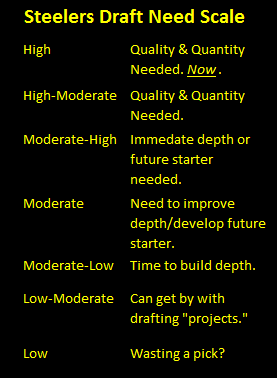 Yet measurable don’t always mean much in the NFL, and Daniel McCullers did make some progress from his rookie to sophomore years, but has seen scant little since then. In fact McCullers snap counts went from 9% and change in 2015, to 17% and change in 2016, to 1.33% in 2017. That’s decidedly the wrong direction. In looking the prospects of the Steelers resigning Daniel McCullers, about the only plausible scenario involved new defensive line coach Karl Dunbar coming in, reviewing film, and seeing something he feels he could salvage. Perhaps Karly Dunbar has done just that. Because really, even with Justin Hargrave not making a lot of growth between his first and second year, and even with L.T. 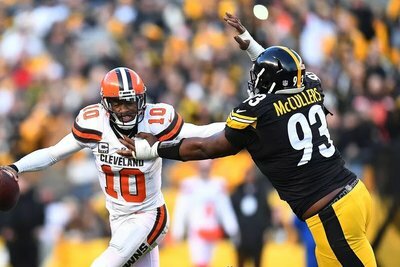 Walton perhaps hitting a plateau, Daniel McCullers body after four years in the NFL offers scant justification for a second NFL contract, even at the veteran minimum. The Steelers declined to activate Daniel McCullers for all but six games in 2017, including the AFC divisional playoff loss the the Jaguars, despite knowing that both Javon Hargrave and Stephon Tuitt were less than 100% going into the game. Perhaps McCullers had an undisclosed injury. That would explain a lot. Whatever the reasons is, Kevin Colbert, Mike Tomlin, Keith Butler, John Mitchell and Karl Dunbar are far more qualified to make that judgment that me. But this resigning is a real head scratcher.